In the early days of railroading, the job of cleaning up a wreck was usually done by men and horses. The first steam wrecking crane, a relatively small affair with a 20-ton lifting capacity, appeared in 1883. Its maker, Industrial Works of Bay City Michigan, introduced a fully revolving model a decade later. As the product became popular, Industrial Works, now renamed Industrial Brownhoist, and its chief competitor, Bucyrus-Erie of South Milwaukee, introduced larger and larger models to cope with increasing locomotive and car weights. By the World War I era, 120 tons was a common size, and by the Second World War, crane sizes topped out at around 250 tons of lifting capacity. While a wreck train on the way to a wreck had priority over other traffic, cranes were subject to rather low speed restrictions, typically around 35 mph with the boom trailing and 25 mph if the boom was facing forward. The larger hook closer to the cab was actually the main lifting hook, used for locomotives. The hook at the end of the boom was a lower-capacity auxiliary hook, used when more reach was needed. Slings, chains, and spreader bars were used to attach the hook to the car or locomotive being lifted; the hooks were never attached directly. To supply fuel and water for the crane, an older tender from a scrapped locomotive was often part of the wreck train. While some cranes were capable of limited self-propulsion, that was only for positioning at a site, not for travel to and from wrecks or jobs. Because of their importance and the urgent nature of their work, cranes were usually well maintained and lasted for many decades. 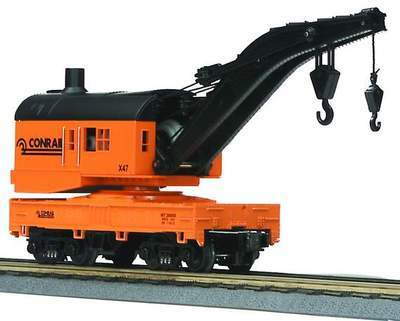 Our model represents a typical steam-powered Bucyrus-Erie crane of about 160-ton capacity built in the first several decades of the 20th century. It would likely have served until close to the end of the century, probably being converted to diesel power somewhere along the way.